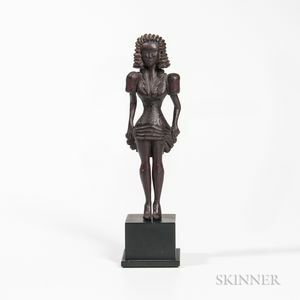 Carved Wood Figure of a Woman Lifting Her Skirt, America, c. 1925-35, the figure with accentuated carved body details posed with arms suggestively lifting her skirt, wearing high-heeled shoes, old varnished surface, with custom base, ht. 8 3/8 in. Provenance: Ricco/Maresca, New York, 1995. Literature: Illustrated in Roger Ricco and Frank Maresca, American Vernacular, New Discoveries in Folk, Self-taught, and Outsider Sculpture (Boston: Little, Brown and Company, 2002), p. 133.